Winyard, David C. “The Promethean Escape.” Social Epistemology Review and Reply Collective 6, no. 10 (2017): 1-3. People obsessed with novel big ideas can find a lot to like in the transhumanism movement. It imagines technoscience solutions to all manner of worldly ills, and technical challenges are of little concern to transhumanists. Things that are too difficult now (e.g., immortality) will, the thinking goes, inevitably yield to super-intelligent artificial minds that will emerge after Ray Kurzweil’s Singularity. 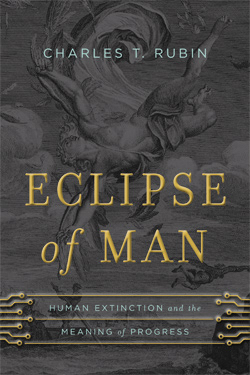 Charles T. Rubin’s Eclipse of Man is a big picture analysis and critique of transhumanism’s big ideas. It examines how enlightenment conceptions of progress have given way to visions of a dehumanized future. In clear and artful ways, Rubin exposes the movement’s unwarranted assumptions. He concludes that transhumanism’s long-term consequences are incomprehensible, and as a consequence, they are not worthy of rational pursuit. Anyone interested in transhumanism—critics and advocates alike—may benefit from considering both the logic and art of Rubin’s arguments. Rubin’s begins his story of dehumanization with the Marquis de Condorcet (1743–1794). Condorcet’s enlightenment rationalism focused exclusively on improving the lot of human society. Like Francis Bacon before, and transhumanists today, Condorcet thought human reason could greatly extend lifespans, but he did not believe immortality could be attained. He did hope that “our power over nature will soften the hard edges of the human condition by improving the material conditions of life,” and this would improve “moral conditions.” Generally, Condorcet’s vision of the future is uncontroversial. Who would not want better and longer lives? Next, Rubin considers Condorcet’s progress in view of Thomas Robert Malthus (1766–1834) and Charles Darwin (1809–1882). Malthus held that “our future holds great misery and scarcity” because “finite resources limit what human beings can ever hope to accomplish,” but Darwin spins “natural competition as a force for change over time.” According to Rubin, today transhumanists attempt to “reconcile and assimilate these ideas by advocating the end of humanity.” Is Rubin right? Are enlightenment humanism and evolutionary metanarratives leading toward dehumanization? Through the next three chapters, Rubin considers recent developments. Chapter Two examines the ongoing Search for Extra-Terrestrial Intelligence (SETI), including a review of its associated science and science fiction. Chapter Three focuses on nanotechnology, comparing Eric Drexler’s nanotechnology visions with Neal Stevenson’s novel The Diamond Age. In the process, inconsistencies emerge between nanotechnology’s promise and its potential to disrupt human lives and relationships. Chapter Four looks to other transhumanist aspirations and their mysteries. The upshot is that logically transhumanism’s assumptions lead to a dehumanized future. Why? Galactic evolutionary competition requires human beings to evolve into technological artifacts. Can we not hope for something better? Unfortunately, Rubin’s powerful analysis and critique falls flat in Chapter Five, entitled “The Real Meaning of Progress.” It can be summarized in five words: there are no easy answers. Instead of solutions, Rubin points toward attitudes (e.g., humility) that can help society deepen its understanding of what human life means, and also what can be lost by forging ahead without maintaining continuous attention to such matters. Rubin frames his conclusions by interpreting three paintings of Icarus. The first shows him being launched into the sky by his father. In the second, Icarus realizes the consequences of his disobedience and is struck by terror. The last shows Icarus crashing into the sea, even as common folk go about their business nearby. The paintings effectively illustrate Rubin’s argument. Reality exists between optimistic and pessimistic views of the future, and the meaning of life today must shape the future. Ignoring or diminishing human life as we know it today will surely take us in wrong directions. Rubin teaches political science, but he does not offer politics as the answer to transhumanism’s challenges. He notes that transhumanism is often sold in techno-libertarian terms, but this may be to distinguish it from eugenics. Freedom of choice is promised, but anyone not adopting technological enhancements would be left behind or forcibly eliminated. The force of evolution cannot be resisted.